Computer software has traditionally been sold to customers as standalone software packages that installed from a physical drive using tapes and floppies then CD and DVD ROMS. These software packages or applications would run locally on a computer and the data would be stored on the hard drive of the machine accessing the content or an external drive. Over time, as the Internet grew and became faster to access for all users, cloud computing took off and other software models, such as Software as a Service (SaaS), became possible that are ubiquitous today. 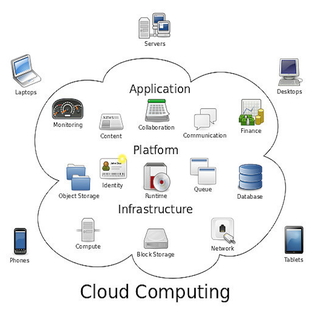 Cloud computing, servers being hosted in remote locations (datacenters) and both mobile and computer systems having robust browser to access data allowed for this model to take off. SaaS is software hosted remotely through the aid of cloud computing and allows users to access software along with their data from any device or browser they choose. This way they do not have to worry about taking local storage space with the software or data loss in case their machine or hard drive fails on them. They also do not have to worry about system requirements or operating system requirements as SaaS is browser based and on demand thus always accessible. SaaS really took off in the small business or SMB space with startups and smaller companies leveraging its business model for employees. It is based on a subscription model rather than high installation and set up fees that traditional client-based software often entails. Examples of popular SaaS implementations include SalesForce, Zendesk, Slack, Shopify and WordPress. However, even though many of us rely on SaaS software for our daily computing needs, the question is how does the business model work for the companies providing us with the SaaS. Payment processing platform, Stripe, has a good article on its website about the SaaS business model titled The business of SaaS. According to Stripe, the two main business models of SaaS include low-touch SaaS sales and high-touch SaaS sales. Low touch relies on potential clients visiting the company’s website, starting out with a free trial and being convinced to continue using the product due to the trial being effective and low friction. Once the trial expires they hopefully subscribe and the business gains a new customer. Often the product is scalable and there are various plans in place with their own separate structures of features. High-touch SaaS primarily deals with larger companies, such as SalesForce, and relies on treating each customer according to specific needs. It requires a human guiding hand in keeping them around long enough to be convinced they need the product in their lives. Text and voice chat are often use to guide them rather than a more robust one-size fits all typical of low-touch SaaS. Low touch SaaS are often low friction and easy to use apps and software that doesn’t need as much customer support or a guiding hand. It also typically makes less money per user acquisition or license and relies on many users singing up to a subscription model. More info about the differences between these two business models of SaaS can be found here, courtesy of process.st. SaaS is great because it allows companies to implement solutions for employees regardless of the operating system, browser or device they work from. It allows companies to have remote workers to collaborate, often in real-time, across geographical boundaries. It is generally inexpensive to implement and companies can choose a subscription model (with low-touch SaaS) that suits their business needs without having to pay extra for features they don’t need. SaaS is also a great way for companies to break into the market with great ideas they can implement as Web apps and leverage for customers without great up-front costs or those associated with selling physical boxes of goods (a cd case with software in it in the traditional sense). It also allows them to sell outside of app stores via a Web portal to rank in profits rather than pay the App Store runner a fee (such as Apple taking in a 30% cut as an example). However, one thing startups and SMBs should keep in mind when working on an idea they want to implement in the form of SaaS is good user feedback and testing before product launch. I know from personal experience that companies in the SaaS space often want to put a product out there before it is really ready to go mainstream and let the market handle it. They do not have patience to wait for critical feedback in the form of beta testing or focus groups ahead of launch. This can turn potential customers or early adopters away and it may be hard bringing them back later once they have the distaste for the product. A free trial mitigates this in many ways and is really the most important thing along with a good user interface companies should be looking at when launching a product. Trials will let users know they can opt out of the product anytime and the best ones for SaaS, especially for SMBs and companies breaking into a new market, also offer sign up with no credit card requirements (until the trial passes and it is time to retain the customer). First impressions count and a user interface with ease of access goes a long way as well. SaaS is really the future of computing as everything is moving into the cloud and on-demand access to software. It is now a great time to enter this market with a bright future ahead.